A three-year-old cancer survivor who was cleared to go on a pioneering drugs trial after an astonishing fundraising effort has touched down in the US. Eileidh Paterson was diagnosed with high-risk neuroblastoma and has undergone a gruelling course of treatment. She was declared cancer-free last week following a string of tests just days before she was due to fly to America for treatment not yet available in the UK. In April, the Forres youngster’s mum Gail launched an appeal to raise £100,000 to allow her daughter to take part in a trial of a treatment aimed at stopping her cancer from returning. And the generosity of people all over the north-east and the rest of the country led to a staggering £125,000 pouring in. Now Eileidh, her mum, brother Callum, sister Cerys and her grandfather have arrived at Grand Rapids in Michigan and she has met members of the medical team who will treat her. Mrs Paterson said last night that the reality of Eileidh’s journey was finally starting to hit home. She said: “Saturday was an extremely long day for all of us as we were up at 5.30am to get to check in at Glasgow Airport before 7.20am. “Amazingly, Eileidh was as good as gold on the plane, sitting watching films. “She had a sleep for about an hour on the plane, but that was all. I’m so proud of how well Eileidh and Cerys have handled travelling such a distance. 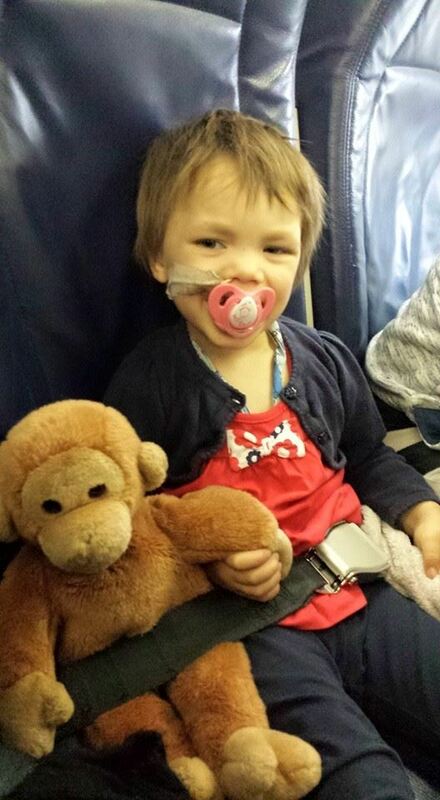 “It’s unbelievable how far Eileidh has come, compared to this time last year. I had read about neuroblastoma children going on clinical trials to the US but never in a million years did I think that would be Eileidh. To help Eileidh settle in, the family had a day out at a local zoo. Mrs Paterson said: “The weather was glorious, and this was the first time in a long time that Eileidh has really been out anywhere, so she certainly made the most of it. Eileidh had no appointments yesterday, so the Patersons visited Helen DeVos Hospital to get all the information about her trial and got to know the facility before her drugs course beginning later this week.